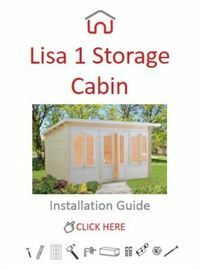 The 12ft x 10ft Lisa 1 Log Cabin is a comfortable, yet sizeable garden sitting room with multiple additional uses, the main being a summerhouse. This robust and durable log cabin I would make as a great suggestion to be used as a garden office, with enough room for more than the standard amount of office equipment. Both double windows and doors highlight the beauty of this model, the georgian bars also being a nice feature from which is of course optional - these can be fitted or disposed of depending on your preference. To prevent against damp or rot we recommend the purchase of our specialist insulation kits and timber treatments that we have available, more details of these options can be found below. Please Note: On Pent Roof (Sloping roof) the optional Shingle Roof Tiles are mostly for cosmetic purposes as to be effective as a waterproof cover they need to be on a higher angle roof pitch. On a standard apex or hipped roof building, the shingle tiles usually last approximately to 25 years, but due to the low pitch on pent roof buildings they will not last as long. We are also able to offer EPDM Rubber roofing for a Pent Roof Building which is the most effective and long lasting roof covering available.